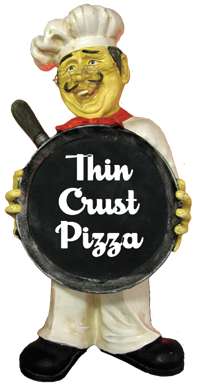 Caradaro Club Pizza: Milwaukee's First Original Thin Crust Pizza! We prepare our pizzas, and all of our menu items, with the best and freshest ingredients available using the same pizza recipes passed down from Milwaukee's original Caradaro Club. All of us at Caradaro Club Pizza would like to thank you, our loyal customers, and let you know that we appreciate your patronage. Dine-In, Carry-Out & Fast Delivery! Consider having your party at Caradaro! We can seat 50 people in our dinning room or we will deliver to you (as fast as legally possible using classic "hotbox" technology). Your friends will love Caradaro Club's authentic Italian thin-crust pizza. Call (414) 476-7700 for details!